The abelia shrub family has around 30 different species of both semi-evergreen and deciduous plants. These abelia plants will provide your landscape with brilliant color, starting around the first of June and continuing through the fall. The peak bloom time will be in June and July. Fall colors will depend on where you live, in warmer climates your they will form deep maroon or purplish leaf color, while in the colder climates this plant becomes a semi-evergreen and will lose more of it's foliage. Most species of the abelia shrub have slightly arching branches with a dense bushy growth and small leaves that are glossy. To get the best growth and maximum bloom, make sure to plant the abelia in full sun to part shade. If you plant it in to much shade the foliage density will decrease. It thrives in a moist acidic soil and once it is established this shrub is fairly drought tolerant. Protect it from the cold winds in the winter. 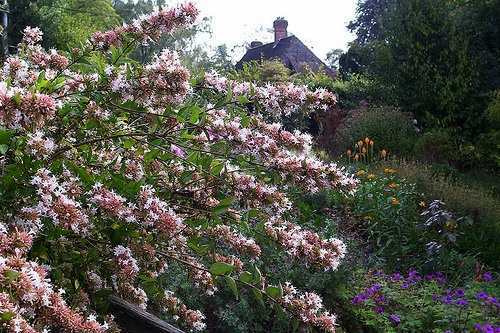 You can prune this shrub in the spring, it is best to do selective pruning instead of shearing the whole shrub. They are known to be disease and pest free.